A car partly powered by its own body panels could be on our roads within five years following the development of breakthrough nanotechnology by Queensland’s University of Technology. Researchers at QUT have succeeded in developing lightweight ‘supercapacitors’ that they say can be combined with regular batteries to dramatically boost the power of an electric car. The supercapacitors – described as a ‘sandwich’ of electrolyte between two all-carbon electrodes - were made by the research team into a thin and extremely strong film with a high power density. The development means that the film could one day be embedded in a car’s body panels, roof, doors, bonnet and floor - storing enough energy to turbocharge an electric car’s battery in just a few minutes. The findings, published in the Journal of Power Sources and the Nanotechnology journal, are the result of the work of the team comprising Postdoctoral Research Fellow Dr Jinzhang Liu, Professor Nunzio Motta and PhD researcher Marco Notarianni from QUT’s Science and Engineering faculty – Institute for Future Environments, and PhD researcher Francesca Mirri and Professor Matteo Pasquali, from Rice University in Houston in the United States. According to Marco Notarianni, the car partly powered by its own body panels could be a reality in the next five years. 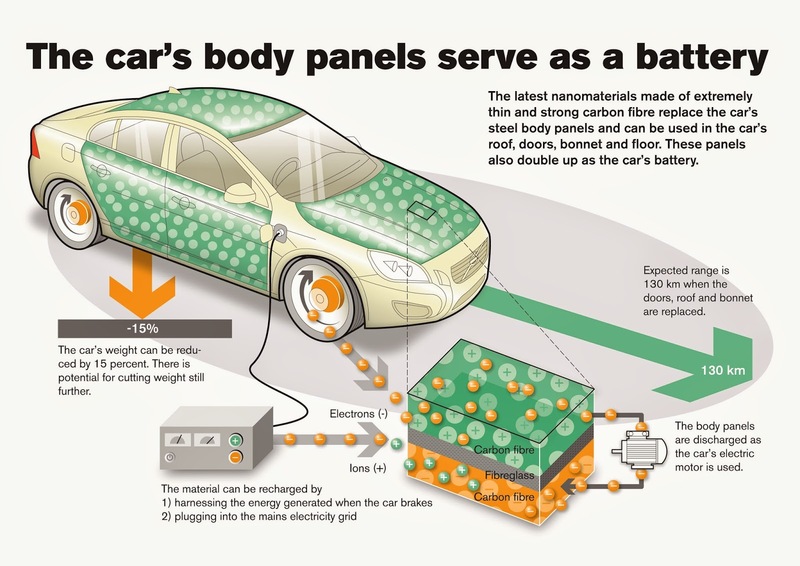 “Vehicles need an extra energy spurt for acceleration, and this is where supercapacitors come in. They hold a limited amount of charge, but they are able to deliver it very quickly, making them the perfect complement to mass-storage batteries. Dr Liu says one of these cars, after one full charge, should be able to run up to 500km – “similar to a petrol-powered car and more than double the current limit of an electric car." According to Dr Liu, currently the ‘energy density’ of a supercapacitor is lower than a standard lithium ion (Li-Ion) battery, but its ‘high power density’, or ability to release power in a short time, is far beyond a conventional battery. “Supercapacitors are presently combined with standard Li-Ion batteries to power electric cars, with a substantial weight reduction and increase in performance. Dr Liu says the technology would also potentially be used for rapid charges of other battery-powered devices. Another member of the research team, Professor Nunzio Motta, says the technology discovery may be a game-changer for the automotive industry, with significant impacts on financial, as well as environmental factors. “We are using cheap carbon materials to make supercapacitors and the price of industry scale production will be low. The QUT researchers who made this discovery are part of the university’s Battery Interest Group, a cross-faculty group that aims to engage industry with battery-related research.